What I can possibly do about the future once my student loans are paid off and I have no savings? I attended a private institution in the USA for higher education and as a result I pay monthly student loan payments so expensive they rival my rent payments. I try not to think very hard about this as doing so can sometimes cause debilitating bouts of depression. Over the past few years I have long since paid off an amount equivalent to the amount I originally borrowed, but naturally, due to interest, I still have over $35,000 left in payments to make. I am barely able to make these payments with some left over for rent, utilities, and food, but with effectively no amount to put into any kind of savings. At my current rate of payment, which is the best I can manage, I will expect to be free from debt, but with 0 savings, at age 40. This strikes me as a very frightening situation as I have effectively lost 2 decades of possible savings that could have been made due to exorbitant student loan costs. As a result, my future prospects seem bleak. For example, I cannot imagine ever possibly being able to purchase a house, but I have no idea how feasible living the rest of your life in an apartment is. This terrible student loan experience (at the time I was also required to have a co-signer, and my Mother agreed to it, for which I feel eternally guilty) has made me very averse to ever taking out another loan ever again. I have attempted to apply for a credit card two or three times in the past and was rejected each time so I can only assume my credit score is terrible anyway. My question is, even when I have paid off my student loans, at age 40, what possible choices do I have for the rest of my life? From reading other questions on this site, it seems like I should have already had a reasonable amount of savings in some kind of savings account, retirement fund, or otherwise that I do not fully understand. I feel that even once I have rid myself of the huge financial and emotional burden of student loans, I will have "missed the boat" on life, so to speak. Thus the best I can hope for is to keep working at my current job until the inevitable layoff or retirement, at which point I cannot imagine being able to support myself beyond that, and so at that point I expect to undergo severe emotional breakdown, depression, homelessness, and possibly suicide. Is there any reasonable alternative I have missed? I can't see you have the slightest problem. Starting at 40 with nothing is totally commonplace. I have started with absolutely nothing at least three times, both before and after that. Your issue is a non-issue. Regarding "Starting at 40 with nothing", I wouldn't be surprised if statistically that is the usual case in the USA. Note that you have a good job so you are far from "starting with nothing" philosophically. I feel that even once I have rid myself of the huge financial and emotional burden of student loans, I will have "missed the boat" on life, so to speak. Say you didn't have these $35,000 of loans. What "extra" would you have at age 40? OK, so you'd have maybe $25,000 extra equity in a house. So what? It's not even worth mentioning. Say I can see the future: And say I told you: "At age 55, you're going to have plus or minus $25,000 equity, in some house somewhere." So what? You'd just say "whatever". It means nothing. If you do have a $35,000 loan you want to pay off, where are you working extra on weekends? At Starbucks or what? So long as your second job is an OK one, you'll very easily pay that loan down. depression. depression (and happiness) are produced by many factors. humans are extremely bad at predicting what events, decisions and situations will make them happy. if you want to learn about how to improve your emotional state, i suggest you ask a more pointed question along those lines or read up on positive psychology. breifly, it sounds like you are missing the "something to look forward to" part of the typical happiness recipe. keep in mind that the primordial part of your brain that controls your mood tends to balance the good vs bad based on how much time you spend thinking about things not how good/bad those things actually are. if your depression is particularly bad, i recommend you consult a professional. especially if you ever start seriously contemplating suicide (e.g. making a plan). debt. excessive debt is a common problem, and does not usually lead to depression on its own. in fact, having a higher income can make you more likely to commit suicide. 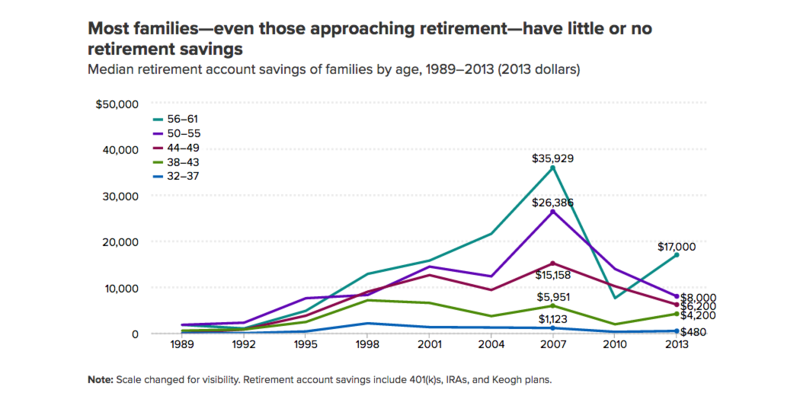 also, putting off retirement savings until 40+ is very common. the nice part about student loan debt is that it tends to be lower interest than other common debt problems (e.g. credit card debt). the fact that you got turned down for credit cards is actually more troubling. that suggests that you have not been paying your bills on time, which is a bigger problem than 35k$ in debt, even assuming you make minimum wage. some optimistic thoughts: most people see their real income increase until at around age 30. also, most people eventually chose to co-habitate with a romantic partner, which eases financial problems (ie they become dinks, dual-income-no-kids). lastly, the automation revolution that is currently underway will probably make everything necessary in life a lot cheaper over the next 20 years. moreover, happiness is mostly about perspective. if you are an american with a minimum wage job, then you are richer than 91% of the world population. suicide is common among the rich because they compare themselves to the even richer. depression is less common among active volunteers in part because they compare themselves to the less fortunate. i know it is tough to acknowledge, but if you are not on track for retirement, then you must cut your spending. unfortunately, those people who can least afford to cut back on spending are also those who have the most to lose if they do not. you should seriously consider what you would be willing to do if you lost your job. would you move back in with your parents? would you sell your car to buy food? would you move in with a group of strangers to make ends meet? would you live in your car rather than on the street or in a shelter? now consider this: would it be easier for you to do that now, with your job, or later without it? if having 3 obnoxious roomates sounds better than living on the street, then perhaps you should look into that option now rather than later. financial planning goes a long way. you haven't given much detail about your financial situation, but simply being on this site is a good place to start. try to get as complete a picture as possible of your situation, then make a detailed plan for how to maximize your comfort and minimize your risk. keep an eye out for opportunities, and try to think strategically about your financial decisions. specifically, you might consider making the minimum payment on your student loans and instead saving some money in an emergency fund, to buy stocks or fund a roth ira. this makes sense if the interest rate (minus tax deduction) is less than your expected return (e.g. 7%). Based on this report you are about $102,000 behind the median person in their forties just looking at college debt and retirement savings. That $102,000 is assuming that your college debt is $35,000 and the median 40s person has zero (probably not true?) 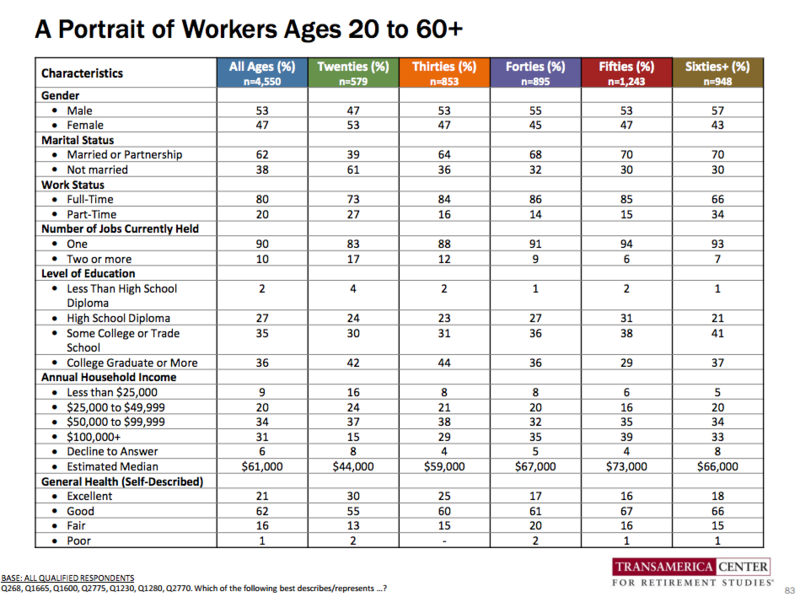 and that you have $0 in retirement accounts and the median 40s person has $63,000 (see page 8 of the above-linked document). The following figure is taken from that report. Note that, to my mind, the sample of people in their 40s has incomes on the high side, which may account for an increase in the median savings compared with the figures below. However, that is just one report. This, more recent, report contains the following figure which says that people in their late 30s / early 40s have only $4,200 in their retirement accounts. what possible choices do I have for the rest of my life? Pay off that debt as soon as practical. Once the debt is paid off, keep those payments as savings into retirement / emergency funds. The thing is to get control of your finances, have a goal in mind, find a strategy towards that goal that works for you, stick to the strategy, and adjust the strategy when life throws other curve-balls at you. With such an expensive education, the assumption would be that you by now are in a job that provides a corresponding income, which would allow you to make your payments and save a lot easily. If this is not the case, the visit of the expensive school might be considered a 'bad investment'. Sorry if that sounds harsh, but nobody said life is fair. However, starting retirement savings with 40 is by far not a lost case. You can catch up on your 401k, if you are serious about it, and easily save enough to retire with 63 and keep the standard of living you have at that time. The typical issue is that at the moment your loans are paid off, you might start spending the extra money instead of saving it, 'just for a while'. And then you are 60 and have not saved a dollar. This is very generic, and I don't know your details, but my advice would be to work on a career, and when your loans are paid off, put the same amount in savings, from day 1 on, no excuses and you will be good. I can see why this situation can be tough to stomach at times; and this is exasperated by general retirement savings advice. There are a couple of things to consider. Over time you should be improving your resume and pressing your income upward. This will either change your repayment schedule or leave you with excess income such that you could start saving. If you don't get to begin your retirement savings until age 40 you will have a very long history of living far below your income. You will be able to simply toggle your student loan payments in to retirement savings, this is likely a much higher savings rate than most 40 year olds. Despite the constant advice that you should be saving for retirement, most people don't have much retirement savings at 40. So, if you start at 40 you will still be well ahead of most people. Separately, and this is more of a rant. With over $1 trillion in outstanding student loan debt, in our lifetime there will likely be a crisis. Whether that changes the dynamic of retirement or leads to various loan forgiveness options, something is likely to change in the next 20 years. You have options to at least get SOME retirement savings going. Secondly, I recommend anyone who wants to invest and doesn't have a lot of money to open up an account with Robinhood. They charge $0 for ALL trades. ZERO DOLLARS!!! So if you only have $100, you can go buy $100 of stock with no commissions. Robinhood account requirements When I signed up they had a waiting list, but the wait is worth it. I'm an active trader and love the fact that my money isn't being whittled down by fees and commissions. Finally, if you have student loans that have variable interest rates, GET OUT! Consolidate them into another loan (or loans) at a fixed interest rate when you have the credit necessary to do so. That way your student loan payments stay the same while your income is sure to increase every year. Between a free trading account and a percent or two in retirement contributions, you can at least get the ball rolling and work your way up to contributing more as your income increases. Why shouldn't I consider a 401k loan to myself within my bond allocation?